« Oatmeal is not very photogenic! Summer is coming, I swear it, though when it will actually arrive no one knows. But even the slight warming that has occurred over the last few months and the lengthening daylight hours has been enough to put a spring (literally and figuratively) back in my step. With the habitual warming weather, of course, our palates go through a transformation as well and rather than longing for foods rich and comforting, we tend to shift toward lighter, brighter and fresher tastes as more fresh produce become available in season. If you are looking for the perfect refreshing, light, flavorful, healthy, colorful, uncomplicated dessert for your next kitchen foray, have I got the recipe for you! Now, this is not at all a recipe that I came up with on my own and I won’t take any of the credit for it, but I, and now a good number of my nearest and dearest friends, can vouch for its being a really wonderful end to a meal or even an afternoon snack. What is this fantastic dessert of which I speak? Well it’s a berry pudding with cream. This, upon first hearing it, may not seem like the answer to all your dessert-centered desires, but let me expound a bit more on the pleasures and details of this simple dish. All that it really consists of is pureed fruit (either fresh or frozen), pushed through a sieve to remove any seeds or pulp. You then add a bit of corn starch and some sugar and put it on the stove, stirring constantly until it boils, and then for just a minute longer. Pour it off into a bowl, let it sit for ten minutes, then press plastic wrap on the surface so that it doesn’t develop a thick crust on top while it sits in your fridge for at least two hours, but up to several days. Perhaps the best part is that you serve it with a mixture of whipped cream, vanilla, powdered sugar, and greek yogurt. 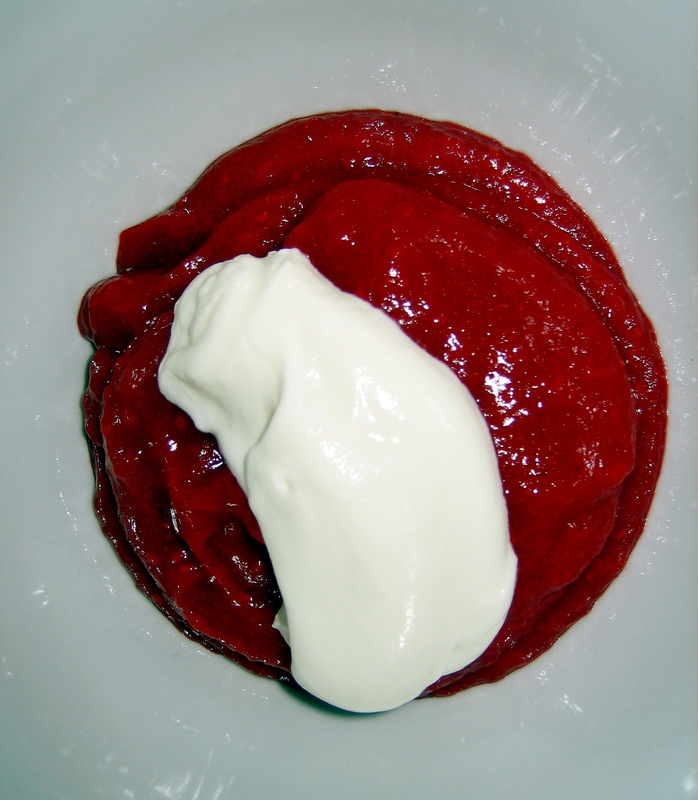 The juxtaposition of the tangy, slightly sweet and creamy yogurt with the fruit in the “pudding” is wonderful. It is almost like fruit-on-the-bottom yogurt in reverse, but not as sweet. I love that the pudding is essentially just straight up fresh fruit and it really explodes in your mouth. I’ve now made both a raspberry and a strawberry version of this for different occasions, next I might try mixing these two flavors together, or I was considering mango (another way to get a dose of my favorite fruit). I urge you to give this recipe a try, it is well worth your time and perfect for the season! This entry was posted on May 23, 2008 at 3:06 pm and is filed under dessert, Food, recipe. You can subscribe via RSS 2.0 feed to this post's comments. You can comment below, or link to this permanent URL from your own site. Oh, I have another variation…it’s quite traditional here, but it entertained me. Take some squishy white bread and cut the crusts off. Butter one side and line a bowl with the bread, buttered side towards the bowl (so you can unmould it later on). Fill with stewed summer fruits (raspberries, blackberries, strawberries, black and red currants, cherries etc) either fresh or frozen (but defrosted). Top with more slices of bread and leave to sit overnight (or until the juices soak through the bread). Invert, remove bowl and serve!